Matlock Town are back in action this weekend with a trip to Hednesford Town. Hednesford are one of the division’s form teams, unbeaten in five matches, lying two places below Matlock on the same amount of points, having played two games more. 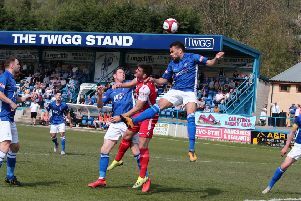 “They’ve recruited very well recently with Conference North and Conference National players so they’ll be strong and are a big football club at this level so it’ll be another tough game, none are easy in this league,” said Matlock boss Dave Frecklington. Matlock then return to the Proctor Cars Stadium on Tuesday night when they face Basford United, who could include former Gladiators striker and assistant manager Shaun Harrad. The outstanding visit to Marine has now been given a date of Tuesday 9 April. Meanwhile, North Ferriby’s withdrawal from the league has seen their results expunged from the league table with the Gladiators losing the six points they gained and a plus four goals difference, yet they rose from 12th to 11th in the table.